Cevicos is a town and municipality in the Sánchez Ramírez province of the Dominican Republic. Municipal population, as of 2012, is of 12,589. Town's proper population is of 4,285. The town is located in a green plateau between Cotuí and Sabana Grande de Boyá. It municipal district (or hamlet) is the village of La Cueva. Cevicos produces fruits like mango, pineapple, sugar cane, passion fruit and many others. ^ "Cevicos Climate Normals 1961-1990". National Oceanic and Atmospheric Administration. Retrieved September 11, 2016. 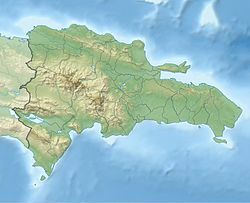 This Dominican Republic location article is a stub. You can help Wikipedia by expanding it. This page was last edited on 5 August 2018, at 01:43 (UTC).